Exercise is always a smart idea, but if you’ve been consistently running three miles a day or repeating the same strength-training circuit for months, you may not be seeing the progress you’d hoped for. In that case, it’s time to stop exercising on autopilot, change your fundamental workout habits, and reap the true benefits of being active. 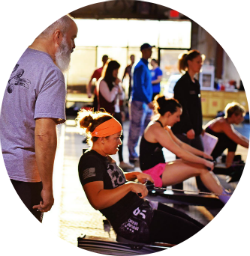 At Bombers CrossFit, we encourage people of all fitness levels throughout Dayton, Kettering, Oakwood, and Bellbrook, OH, to make the most of their workouts. Keep New Muscles Engaged: When you keep using the same muscles over and over again, you’re increasing the risk of injury and preventing new muscles from having the opportunity to develop. Keeping a wide range of muscles engaged is essential to achieving a well-rounded physique and boosting your cardiovascular function. The certified trainers at our CrossFit gym will teach you to train new muscles with proper form so that you don’t get hurt in the process. Beat The Plateau: When you constantly put your body through the same routine, it learns to adapt to the demands of that workout. Even though you’re doing the same exercises at the same level of intensity, your body will burn fewer calories as it gets used to the activity. By switching up your gym routine, you’re urging your body to push itself in different ways, burning more calories and fending off a dreaded “plateau” in your weight loss journey. Keep Boredom At Bay: Let’s face it—doing the same workout every day can get boring and cause you to dread your trips to the gym. However, changing things up keeps your mind entertained and your body motivated. Whether you’re trying a CrossFit program, enrolling in a boxing class, experimenting with Zumba, or adding sprints to your morning jog, there are countless ways to stay fit and have fun in the process. It doesn’t matter if you’re a stay-at-home mom or a military veteran—CrossFit can adapt to your individual needs and make you a stronger, healthier person. To sign up for one of our celebrated sessions, contact our Bombers CrossFit team at (318) 401-1538 today. Visit the website to learn more about our services and guiding philosophy.